One of Alan Bennett’s best bits of writing is set in a hospital. It was a 1982 Play For Today called Intensive Care, and one of half a dozen collaborations with Thora Hird, whose sad eyes and matter-of-fact tone gave her the ability to deliver a Bennett-ologue like no other actor could. There’s something about that meeting of sorrow and absurdity contained within all hospitals that perfectly suits his style. On top of that, Bennett has an ear for older women’s voices. His most supreme creations have always been the Thora Hird, Patricia Routledge, and Maggie Smith roles. 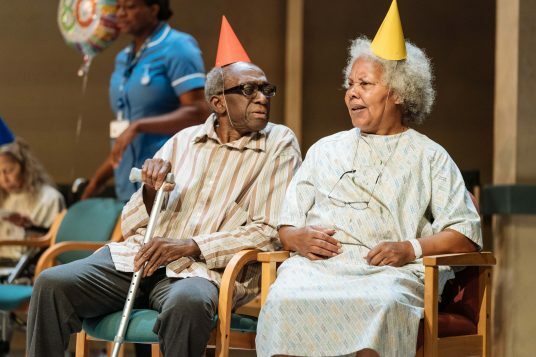 Given that this new play is about a group of elderly patients in a hospital and is helmed by regular collaborator Nicholas Hytner, Bennett’s first play in six years should be wonderful. And for a good 40 minutes or so, it is, until it takes an unexpected swerve. The Bethlehem, or the Beth as it’s known, is well loved locally – an all-rounder catering for everyone from birth to death. It’s meeting targets, making money, it’s clean. But still it’s facing closure. In an effort to bring a bit of light to the patients’ lives one of the nurses has formed an impromptu choir. Even if their memories are going and their legs are arthritic, the elderly patients can still remember lyrics to old songs, and routines to old dances. As ever, Bennett has fun at the expense of modernism, like the way the hospital has changed the names of its geriatric wards – “William Wordsworth is Joan Collins – keep up,” one character snaps. Designer Bob Crowley extends that vein of humour to his set, mucky hospital walls in institutional peach, where a blue NHS sign directing patients to the various departments has ‘Chapel’ directly above ‘Endoscopy’. As so often before, what feels like a big Bennett hug, a sweet plea for the value of elderly lives, actually hides a cutting political edge. 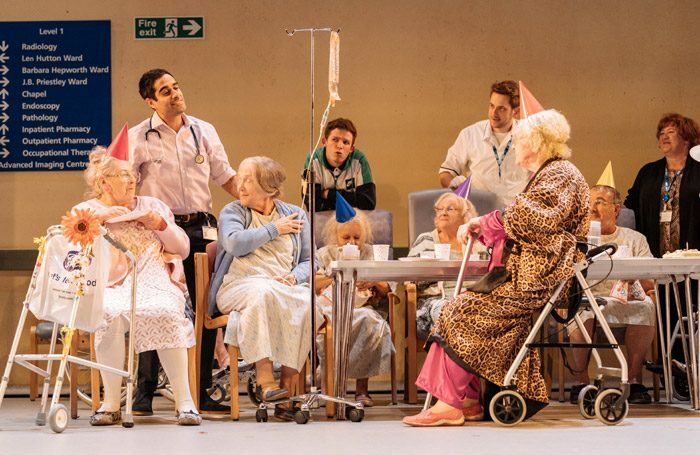 As one nurse points out, none of the patients should be sticking around long enough to form a choir. That’s where the politics enter. Deborah Findlay plays a nurse who’s been there for 25 years, and the resignation in her voice says everything about the relentlessness of nursing, especially when it comes to the geriatric ward. Her job is dealing with sponge baths, incontinence, patients exposing themselves, and being aggressive. Those patients on the other hand are dealing with worn out facilities, worn out medical staff, and an entire system that doesn’t want them. Has absolutely no idea what to do with them. Only registers them to the extent that they block up beds for younger, more curable people. It’s a pretty depressing situation, more depressing than a lot of Bennett’s other work, and Crowley knows how to make the patients look a sorry lot, draped in shapeless, pale hospital gowns and slouched in vinyl covered chairs. 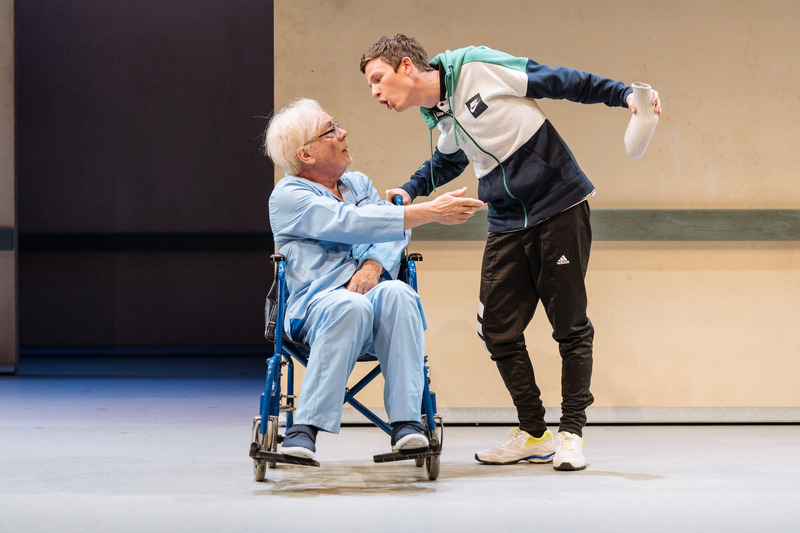 A lot of the lines are thrown into the air like a coin toss, and it isn’t obvious if they’ll land on comedy or tragedy; if they’re going to make us laugh or make us cry. 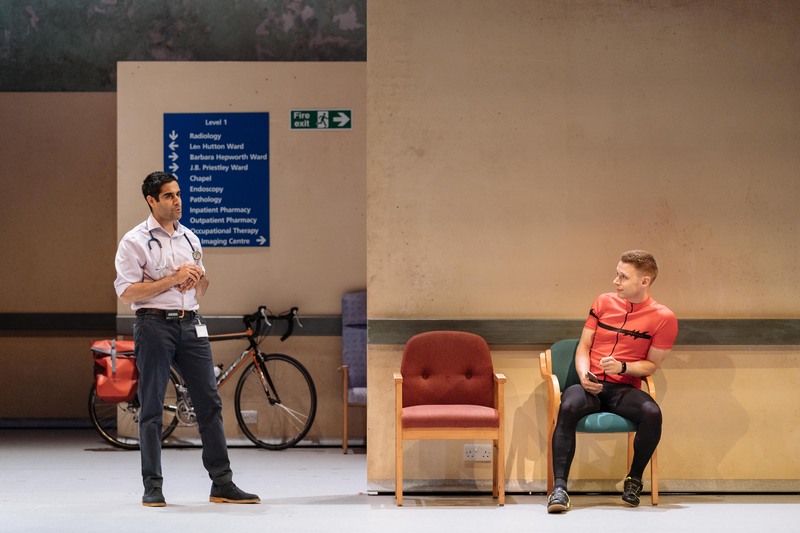 It’s only after all this has been set up that sinister plot emerges, one in which Bennett provides a very good reason why the hospital should actually be closed, which sort of negates the point that the play was making. 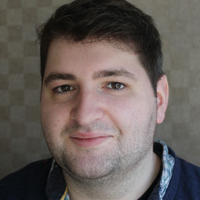 He shifts the direction of the narrative so that the Beth, which had been an archetype for all the hospitals facing their end and all the old people being devalued on wards, becomes a complete anomaly. 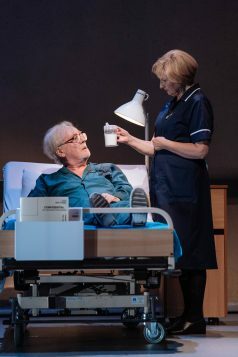 Perhaps the play is saying that financial pressures, lack of resources, overwork and the imperative of meeting targets all combine to make this dark scenario more likely. It certainly makes it very clear just how vulnerable people are at the end of their lives. But it feels a bit jarring. Another problem is that the play simply contains too many characters. They don’t have room to grow and a great deal of the play feels like collage. Some are great but underdeveloped, like Jeff Rawle’s Thatcher-bashing ex-miner Joe, while others are a bit muddled, like Joe’s son Colin, a progress-pushing slick young Tory, played by original History Boy Samuel Barnett. 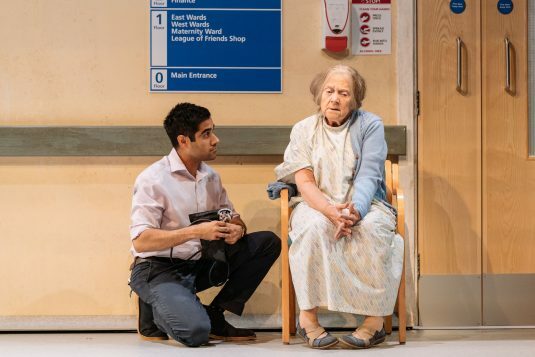 Only Findlay’s grim nurse character is allowed a proper story arc, a proper inner life, but it feels too far-fetched, despite her brilliantly intense performance. 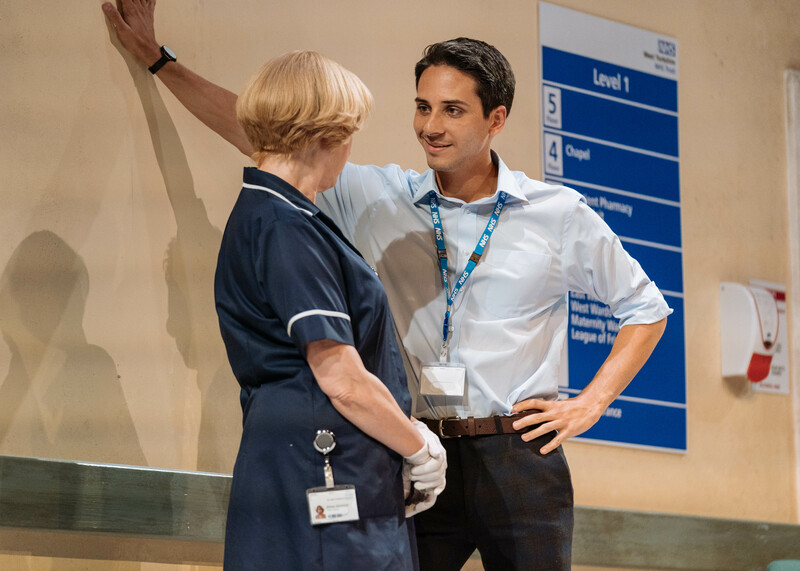 That said, Peter Forbes does a great job as the ambitious, officious, slightly desperate chair of the hospital trust, and there’s a distressing dignity to Sacha Dhawan’s Doctor Valentine as he’s rejected by a country to which he’s devoted his skills. The sharp lines Bennett is famous for are here (“there’s gay clubs in Barnsley now”), but the play as a whole could do with buffing up. Like the hospital gowns its characters wear, it’s on the baggy side. Still, there are some wonderful musical interludes by the geriatric choir, set to George Fenton’s lovely arrangements with the simple, joyful choreography by Arlene Phillips. 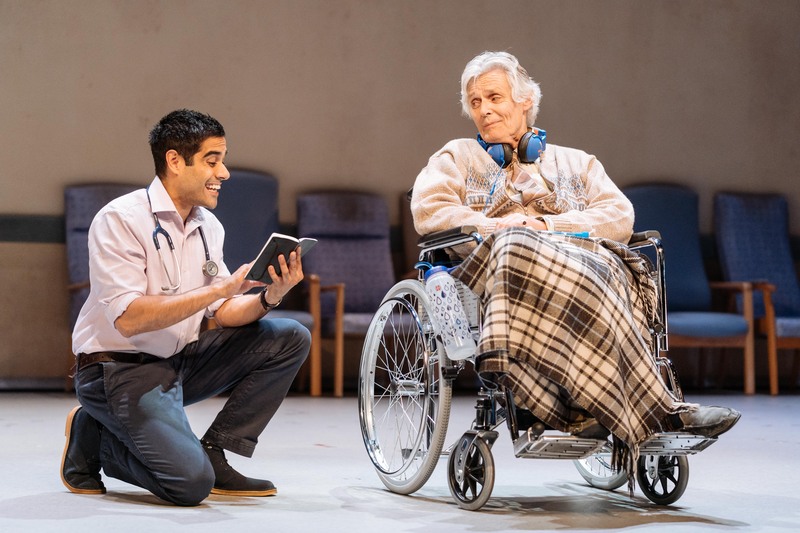 At its most effective the play hones in on the moments of care and kindness that still manage to exist, even within a target-driven, throttled hospital system.